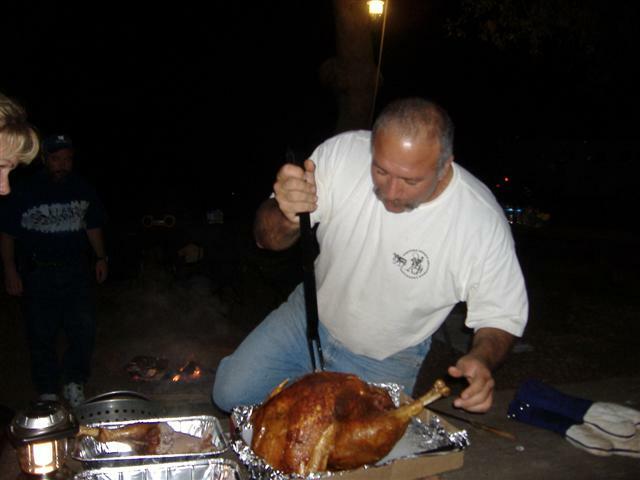 ﻿ HuntingNut » Forums » General » General » Deep fried turkey? Posted: Sun Dec 09, 2007 12:15 am Post subject: Deep fried turkey? Does anyone do them and how many. I have done 230+ since 1999. 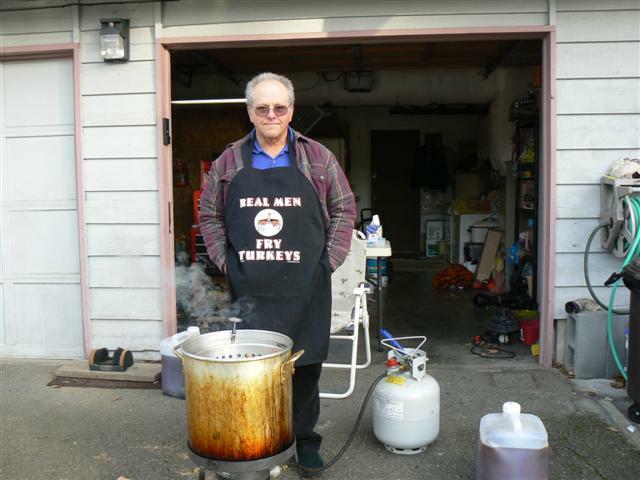 There are still lots of people that have never had deep fried turkey. Posted: Sun Dec 09, 2007 12:55 am Post subject: Re: Deep fried turkey? I've done a few, 5 or 6... I havent run into a recipe though I really like. They turn out juicy for sure, but I'm having trouble finding a good tasting marinade / seasoning to go with. Posted: Sun Dec 09, 2007 8:55 am Post subject: Re: Deep fried turkey? 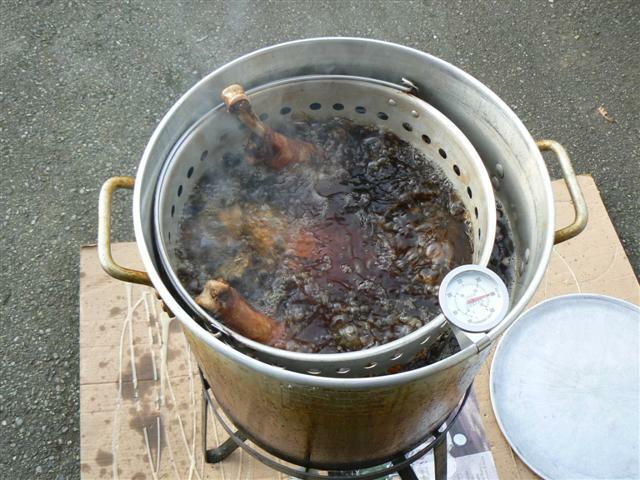 Never had a deep fried turkey, one of these days I'm going to have to pick up a turkey deep frier from Bass Pro I think. Posted: Sun Dec 09, 2007 9:18 am Post subject: Re: Deep fried turkey? Posted: Sun Dec 09, 2007 9:44 am Post subject: Re: Deep fried turkey? My favorite marinade is to take a bottle of Mesquite and a bottle of Cajun and mix them 1/2 n 1/2 add some Tabasco. You have to put it in a blender and puree for a long time to get the "floating spices" cut up. Some of the Eastman brand marinades are very good also. They don't plug up your injector as much as those with a lot of "floating spices" because they are pure liquid. The one in the picture yesterday was an Eastman Garlic n Butter. 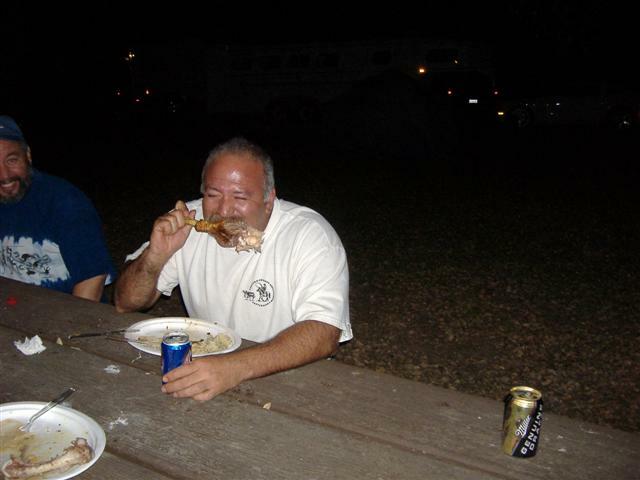 It went over great at our Christian Motorcyclist Association chapter party. Another recipe is to take liquid garlic, liquid onion, Tabasco, liquid smoke, Accent tenderizer and mix to your liking. It injects good. 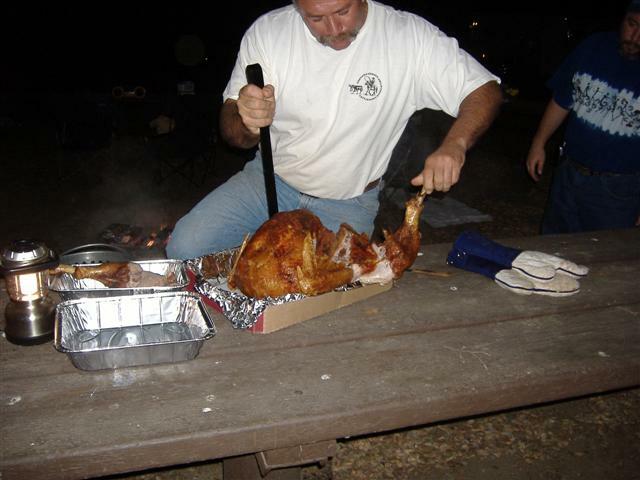 The tenderizer helps it to penetrate the meat for an even distribution throughout the bird. Posted: Sun Dec 09, 2007 10:31 am Post subject: Re: Deep fried turkey? I have not done one my self but on a few occasions had some my buddys have done and it is great I love it deep fried I will at some point get a deep frier. Posted: Sun Dec 09, 2007 8:52 pm Post subject: Re: Deep fried turkey? I use Dr Pepper as a marinade (mixed with some spices) and have never heard a complaint. Posted: Tue Dec 18, 2007 4:32 am Post subject: Re: Deep fried turkey? I've fried a few myself, they are good. You've got to make sure that it's done before you take it out. 3.5 min. per pound at 375 degrees. I do whole chickens as well. I think chickens are 11 min. per pound. Crispy and juicy. Posted: Tue Dec 18, 2007 10:32 pm Post subject: Re: Deep fried turkey? You are correct about chickens taking longer to cook than turkey. I can only think that the size of the cavity is smaller and the hot oil doesn't circulate as well inside the bird. They sure are juicy though. Posted: Wed Dec 19, 2007 12:07 am Post subject: Re: Deep fried turkey? I have likely cooked 30-35 turkeys in the last 2 years. We do quite a few in the summer at the lake as you can feed lots of people off one bird and usually pick them up for a buck a pound. I have tried marinades but they tend to flavor the oil and then you have to throw it out (refrigerate it up to 8 months otherwise). The one that we did enjoy though is plain old Italian salad dressing injected. As for cooking time I find they take about 3 tall Rum & Cokes . When you are done your feast don't through out that carcass as it makes excellent soup. Posted: Sun Mar 02, 2008 4:43 am Post subject: Re: Deep fried turkey? What's so crazy about Dr. Pepper as a marinade? Try mixing equal parts ketchup and Coke. Throw in as much Tony Chachere's creole seasoning as you can stand and you've got a real winner! Fill your pot with as much oil as you're going to need. Turn on the glame to heat the oil to the correct temperature. If you don't turn off the flame the splattering oil could catch flame. Ever seen a HUGE grease/hot oil fire? Ever had third degree burns? Definitely not fun. Posted: Sun Mar 02, 2008 9:04 am Post subject: Re: Deep fried turkey? I have cooked over 230 turkeys and lots of chickens too, I have never turned off the flame while lowering the bird into the pot. If it is done carefully there is minimal splatter and it would take a lot for canola or peanut oil to flash over into a fireball. Just be careful. The last thing I want to do is bend down and try to relight a burner with the oil splattering out on me. I have run five pots at a time on many occasions without incidents. The key is to know just how much oil to put in and then lower the bird in very slowly. 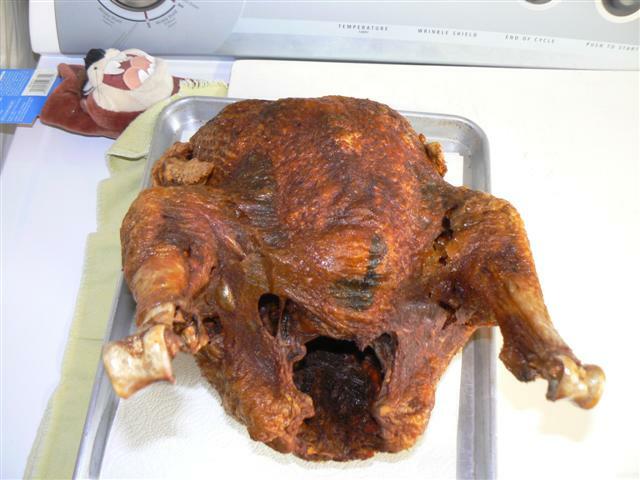 Posted: Sun Mar 02, 2008 2:36 pm Post subject: Re: Deep fried turkey? If you let your turkey drip dry or pat them dry with paper towels before you lower them into the hot oil, you won't have so much trouble with the oil boiling over. Hot oil and water don't mix very well. I always inject mine with melted butter mixed with any seasoning you would use to cook chicken. Even a mixture of butter and a little red pepper powder works for me. Posted: Wed Mar 05, 2008 7:32 pm Post subject: Re: Deep fried turkey? remember when frying ANYTHING after removing it it continues to cook so you want to take it out a couple of minutes before you think its done. that first picture is of a turkey cooked either way too long or the oil was way too hot or it was old oil. you have to remember the weight of the turkey will displace the oil so if you dont fill the thing up with oil you shouldnt have a problem with spillage and flame ups. do you guys know of those pan grease splatter lids. they fit on the fryers from what my folks till me. marinade with dr pepper now thats a new one. been a chef on and off for 30 years and l have NEVER heard of that one. nor coke and ketchup. jack daniels and creole spices is a popular one here in the valley. turkey you need to marinade a good two days before cooking or frying. if you lightly coating with seasoned flour makes for a awesome coating and keeps some of the moisture in cuzzzz frying does tend to dry it out. Posted: Wed Mar 05, 2008 9:29 pm Post subject: Re: Deep fried turkey?